Interessting! So if I got that right all the clients just listen to the sync message, which will be received once per beat, and the sync message determines when the next beat will occur, due to the BPM, the timestamp and various offsets? What happens if a OSC message is dropped due to poor network conditions? 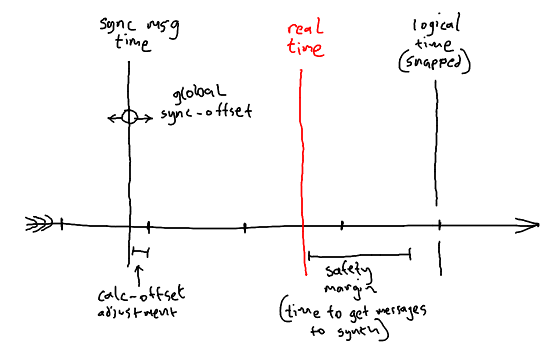 In theory you only need to send the osc message when the bpm changes – as (calc-offset) will work whenever the last sync-time was, so dropped messages are no problem.